Prenatal genetic screening helps avoid having children with genetic diseases, and the newborn screening is directed towards an early and appropriate treatment. Both thus prevent lifelong handicaps in children. Mutations are on the rise. commonly sought after by young couples. Individuals undergoing genetic screening are therefore not referred to as patients but as "probands", and those undergoing genetic counseling are called"consultands". Direct examination of the DNA molecule itself. Individuals DNA sample is obtained blood or any other tissue, and is scanned for mutations. Biochemical tests for gene products. For example, enzymes and proteins. Microscopic examination of stained or fluorescent chromosomes. Consanguineous marriage’s offspring has increased chances of being born with rare autosomal recessively inherited condition. i. 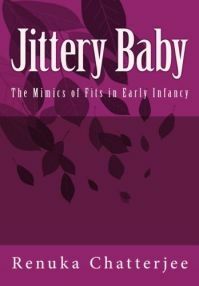 Mothers over 35 years of age at the time of delivery are at increased risk of having a baby with trisomy defect. ii. Acute or chronic illness in mother. iii. Teratogenic agent exposure as medical drugs, radiation, chemicals, smoking, alcohol or in food articles. Ethnic groups that are known to have high incidence of certain autosomal recessively inherited disorders. For example: African American ancestry for sickle cell anemia, Mediterraneans for thalassemia and Jewish background for Niemann-Pick, cystic fibrosis and so on. Alpha-fetoprotein are secreted by fetal liver, gastrointestinal tract, and yolk sac. It is found in high abnormal levels in amniotic fluid of a fetus with disruption in the continuity of the skin due to causes like neural tube defects (encephalocele, anencephaly, myelomeningocele ) or omphalocele. Some of AFP crosses the placenta and enters mother’s circulation. It is present throughout the pregnancy, but the levels are highest between 14-18 weeks of gestation. 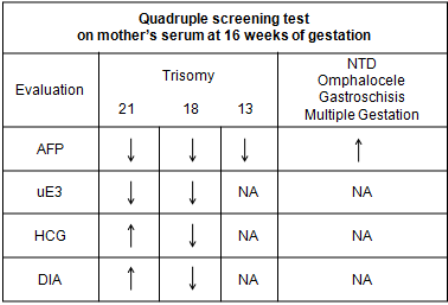 80 percent of the cases of NTD can be detected on the basis of high levels of AFP in mother’s serum. 50 percent of the cases of chromosomal defect in the fetus can be detected only on the basis of lower than normal levels of AFP (opens a new window) in mother’s serum. 80 percent of the cases of fetal chromosomal defect can be detected when the above three evaluations are included in prenatal screening. However, false positive and false negative results are possible. It is performed at 18 weeks of gestation to rule out related congenital anomalies. Total fetal scan is done to evaluate organs structural formation. It is usually done between 15-18 weeks of gestation for Cytogenetic studies on the amniotic cells, DNA testing and biochemical analysis. The analysis requires about 20 ml. of amniotic fluid, aspirated through an ultrasound guided needle puncture of the amniotic sac through the abdominal wall. This procedure has approximately 1 in 300 chances of loss of pregnancy. It is an invasive procedure done for genetic screening. It determines chromosomal or gene disorders on a small sample of placental tissue obtained by needle biopsy. The placenta can be reached through abdominal wall or through cervix under ultrasound guidance. It is performed between 10-12 weeks of gestation. There is 1 in 100 chances of pregnancy loss following this procedure. It is also known as Preimplantation Blastomere Biopsy. It is a new procedure and is controversial. For genetic screening related pages, please look in right column of the page.